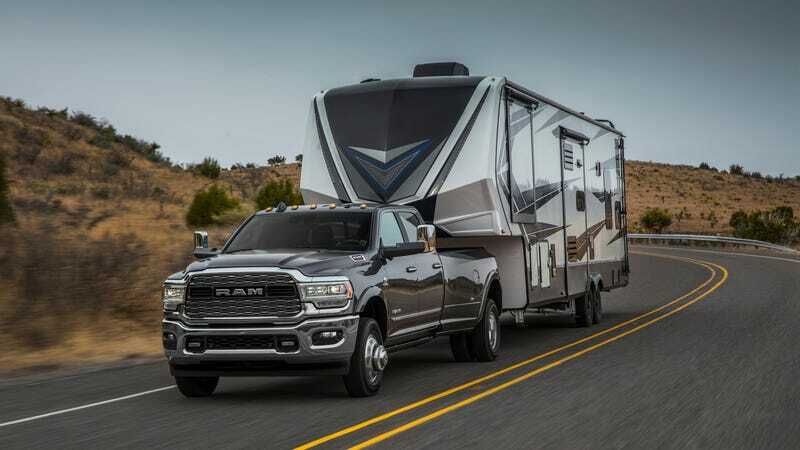 The 2019 Ram Heavy Duty’s banner feature, at least in terms of the torque wars between American truck brands, is its 1,000 lb-ft of torque and 35,100-pound towing capacity. But in addition to those numbers, Ram also claims features like adaptive cruise control and auto braking will work with 35,000 pounds in tow. Ram’s Heavy Duty brand includes trucks like the 2500 and 3500, which debuted for the 2019 model year at the Detroit Auto Show Monday. As we learned from some early information overnight, the new Heavy Duty ups its torque numbers from a max of 930 lb-ft to 1,000 lb-ft, and towing capacity from a max of 31,210 to 35,100 pounds. It’s a decent jump, if you’ve got your life in tow behind you. Ram didn’t show any tests or footage of the features working with a trailer on the truck during the debut, but if auto braking does work with 35,000 pounds hooked onto the back, that means the new Heavy Duty has quite the heavy foot if the driver gets themselves into a bad situation. Two people who worked on the truck, Rod Romain and Troy Davis, told our David Tracy at the show that the new Heavy Duty will actually activate the exhaust brake if necessary to slow the truck down while adaptive cruise control is on. Not every new Ram Heavy Duty will be able to tow 35,100 pounds and carry 7,680 pounds in payload, though. That’s the top engine option, the 6.7-liter Cummins Turbo Diesel, which Ram rates at 400 horsepower at 2,800 rpm and 1,000 lb-ft of torque at 1,800 rpm. There’s another Cummins variant available, with 370 HP and 850 lb-ft, and a 6.4-liter Hemi V8 with 410 HP and 429 lb-ft. The diesels get a six-speed automatic transmission, while the gasoline engine gets an eight-speed auto. The manual transmission died with the 2018 Heavy Duty diesel, Ram confirmed to Jalopnik in an email. With these higher power numbers and towing capacities, it’s only natural for safety features like auto braking to become more able to handle them. But if it weren’t for a big battle of bragging rights between American truck brands, we might not be here in terms of towing and safety. As David talked about and masterfully compiled a timeline of over the weekend, the Heavy Duty with 1,000 lb-ft is the latest iteration of the modern torque wars amongst American trucks. The pattern can be seen from about 2010, when Ford came out with a Power Stroke diesel engine for its Super Duty with 735 lb-ft. Chevrolet then brought out a Duramax truck with 765 lb-ft, and Ford upped its Super Duty to 800 lb-ft that summer. The Ram, which made 650 lb-ft when this all began, came back with a 800 lb-ft Cummins in early 2011. By 2013, the Ram 3500 was at 850 lb-ft. But it didn’t stop there, obviously. Ford took its Power Stroke diesel to 860 lb-ft in 2015, and Ram’s Cummins went to 865 lb-ft. Chevrolet upped its number to 910 lb-ft and Ford brought 925 lb-ft onto the market in 2017, before Ram came around with 930 lb-ft. The 2018 Super Duty then brought the bar to 935 lb-ft.
Now we’re here, in 2019, with a Heavy Duty that makes 1,000 lb-ft of torque. The torque wars probably won’t stop anytime soon, meaning the need to keep up with their capabilities in terms of safety features won’t, either. Even still, if the new Heavy Duty can auto brake like the average family sedan while towing the weight of about 10 family sedans behind it, it’s hard not to be impressed.